A week ago today my mom and sister came into town. Friday during the day I showed mom how to make cake pops (or how to start them at least), we started making food for Seder, I took a half day at work, and mom and I went shopping for stuff for the cake pops. 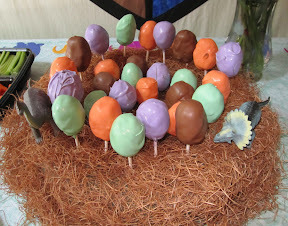 The problem with cake pops is that you need to create a display for them. So we went to Hobby Lobby and got some floral foam and some fake moss so we could make a "nest" for the dinosaur egg cake pops. Friday night some friends came over and we had Passover Seder. It was very nice to have Seder with my family and friends, even if the evening was a touch more irreverent that I would have liked. We got to eat at the table (if you don't know the store of the table, ask lordaerith about it some time. I even had a touch of wine for each of the glasses of wine one must drink (and I buy the GOOD Kosher wine). Saturday was get up and finish the cake pops with mom. Then finish cleaning the house (aka stuff things that shouldn't be out in rooms that will be closed off) while queencimmy, Byskwik, and mom got the last of the party things (including decorations). Our baby shower was fantastic. You can read all about it and see tons of pictures from it on my pregnancy blog. After the shower, mom, Cimmy, and I watched the last episode of Treme Season 1. We all got a bit emotional. Big surprise. Then all four of us went out to a birthday party for some friends, but we didn't stay too long. Sunday mom and I got up early and had a really wonderful talk. Then she and Cimmy had to leave and Aerith and I collapsed into exhaustion. Yesterday I did my first full laundry load of baby clothing. So much and yet it all fit easily into the washer and dryer.